The guest room switch is simple and fashionable, and there are many colors for you to select, such as ivory, champagne gold. Adopting surface plating technology, so it does not fade easily. With LED lights, the switch can be easily operated. We can OEM the language as your request. Panel option: two, three, four conjoined panels. Ultra-thin functional module design is suitable for most of the switch box on the market. As our customers are all over the world and each has his language, we can OEM the language as per request. The switch is elegant and in top grade. The noble and elegant appearance can enhance hotel's grade. With surface be plated, it will not fade. The simple and fashionable design making the switch look luxury. 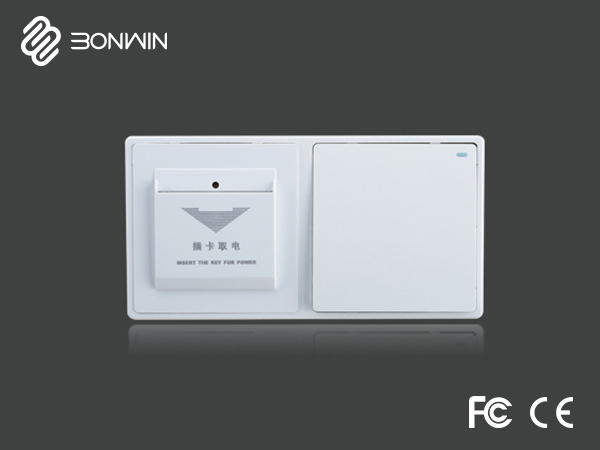 Bonwin's push button on off switch for guest rooms has many types of panels: two, three or four joint panels. The ultra-thin functional design helps it to fit most of the switch bottom box in the market. There are many colors for option like ivory, champagne gold, stainless steel wire drawing and etc..